CHARLOTTE, North Carolina - NASCAR fined Kyle Busch $50,000 on Monday and placed him on probation through the end of the year for wrecking Ron Hornaday under caution at Texas. NASCAR also warned Busch that he will be suspended indefinitely if he is involved in any other action "detrimental to stock car racing or to NASCAR, or is disruptive to the orderly conduct of an event." Busch was scheduled to run only in the Sprint Cup Series race this weekend at Phoenix, it's not clear how many events he had planned to enter in next week's season finales at Homestead. 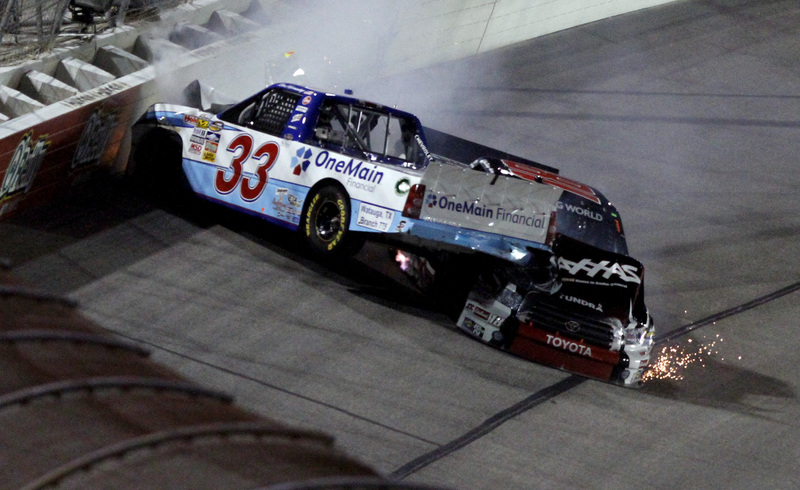 Busch and Hornaday were racing each other early in Friday night's Truck Series race at Texas when Busch deliberately wrecked Hornaday, a championship contender, under caution. "I lost my cool, no doubt about it," Busch said after the wreck. NASCAR, which pulled Busch off the track after the wreck with Hornaday, parked Busch for the Saturday and Sunday races at Texas as further punishment. Busch became the first driver since Robby Gordon in 2007 to be suspended from a Cup race. Kevin Harvick was suspended in 2002. Harvick and Gordon were fined $35,000 each after their suspension, and both were placed on probation through the end of the year. They were also warned with the exact same language used in Monday's warning to Busch. Busch could still face additional discipline from Joe Gibbs Racing or sponsor M&Ms. Michael McDowell replaced Busch in Sunday's Cup race, and Busch watched it from atop the JGR pit box. "I understand why I was taken out of the car for the rest of the weekend. NASCAR officials had to act, and I accept their punishment and take full responsibility for my actions," Busch wrote Saturday in an apology letter posted on his website. "As a racecar driver, the hardest thing to do is to sit on the sidelines listening to cars on the track when you know you should be out there competing. For this, I have no one to blame but myself." Busch was a title contender at the start of the 10-race Chase for the Sprint Cup championship, and he opened it tied with Harvick as the top seed. But he faltered through the first few races and has not been a threat. He's had a good deal of drama this season, too. Busch was on probation earlier this season following a post-race, pit-road confrontation at Darlington with Harvick. He was cited for careless and reckless driving, and speeding after driving 128 mph in a 45 mph zone. He later lost his North Carolina driver's license for 45 days as part of sentence that included a $1,000 fine, 30 hours of community service and a year of unsupervised probation. He clashed in the garage with rival team owner Richard Childress at Kansas in June and intentionally wrecked Elliott Sadler during the truck race at Bristol.